Focusing on the minor details and decorations of a wedding may seem trivial to some. To you, each and every square inch of your venue and reception areas are your canvas and you are about to cover it in your creativity. 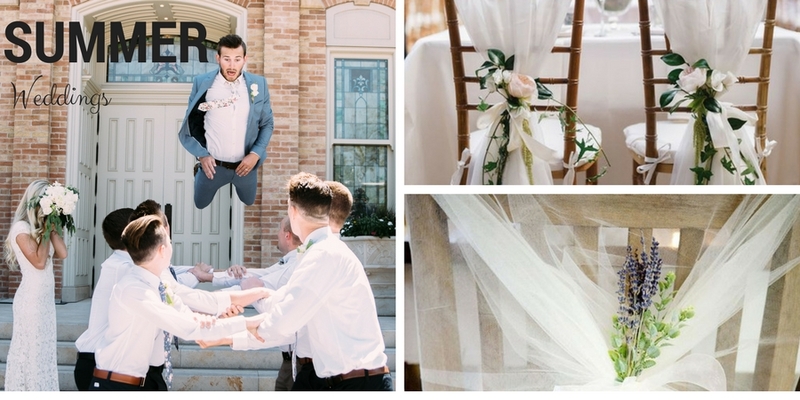 If you are wondering what to look for, how to decorate, or just an idea of where to start with the chairs you will be using for your wedding reception, then continue reading. One of the most important elements to consider when designing your wedding is the theme. When you choose a theme, you have a starting block to work with as you decorate each piece of your venue and reception. The theme should be seen in every element of your venue and reception from the bouquets to the lighting. Work towards establishing a theme that is tailored to you as a couple. 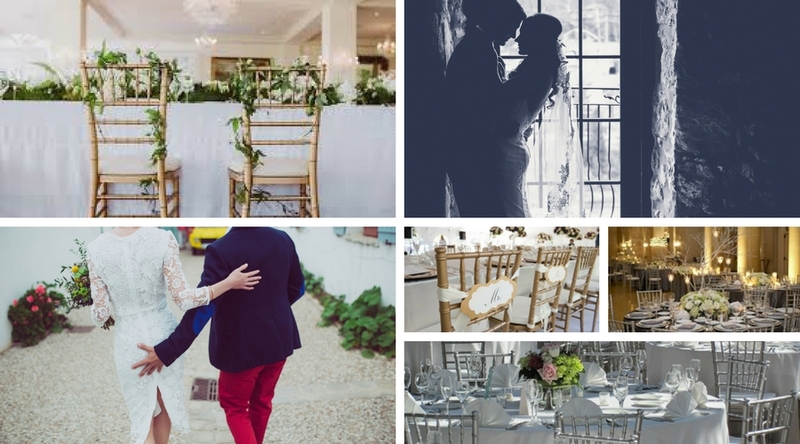 Once you have a theme sorted out, and details for your venue established, work towards developing your vision for the chairs and tables at the reception. 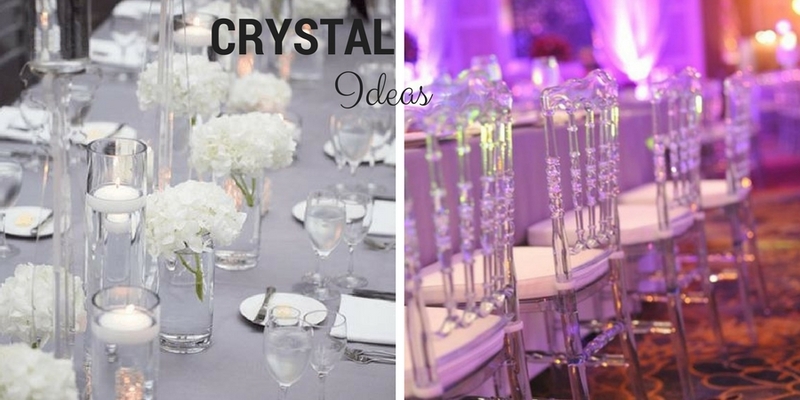 Below you will find a few inspiration decorating ideas for the reception chairs. 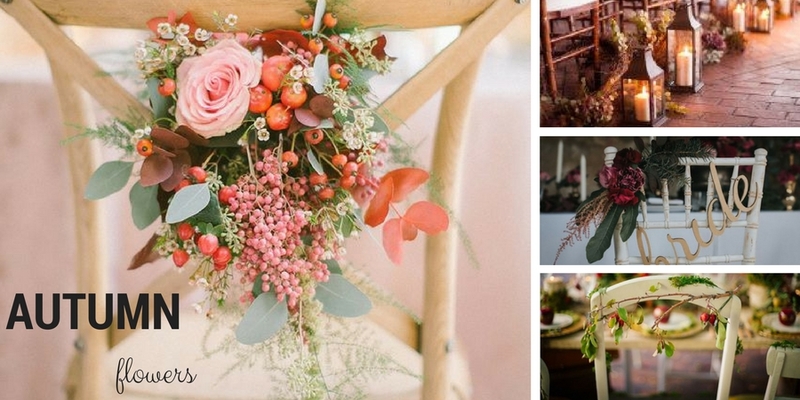 The seasons are often easy to play with when designing a theme for your wedding. Each season is unique and will present you with many beautiful ideas. 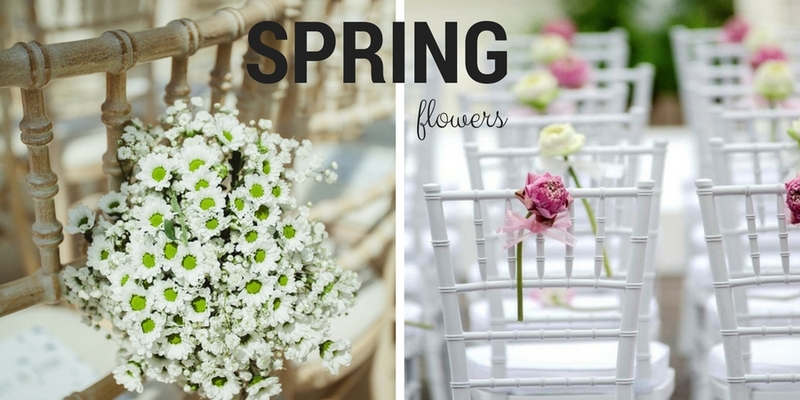 Flowers are the focal point in many Spring themed weddings. Daisies, tulips, and baby’s breath are excellent flowers for the following DIY ideas. Start with a plain ever popular Chiavari chair. Wrap a sheer ribbon in a colour of your choice around the chair and tie it in a loose ribbon on the back. Gather a large bouquet of daisies and place it inside of the bow you have created. Secure the bow so that none of the daisies fall out of place. Choose a single pastel-coloured flower. This could be a daisy, a tulip, a rose, or another Spring flower. A delicate flower will send a powerful message. Select a long, thin, and sturdy ribbon. Tie the single flower to one side of the chair near the top using the ribbon. You may tie either a knot or a bow. Summer weddings are among some of the most popular and well-attended weddings because of beautiful weather, longer day time hours, and bank holiday opportunities. Take this time to play off of the fun and lighthearted opportunities that summer has to offer. Start with a simple chair of your choosing. Style does not matter. Select between one and three colours that are important in your colour palette. Choose a solid colour seat cushion to place on each chair. Drape a thick solid coloured ribbon of a different colour between the peaks of the back of the chair. Choose a Chiavari chair with a series of horizontal rungs along the back. Take three or five separate strips of draping material and weave them through the rungs making sure to alternate with each new strip. Choose a decoration that can be found throughout your theme. This may be a flower, a starfish, an unlit candle, or even a coloured ribbon. Attach that decoration to the bottom of the center strip of draping on each chair. If the object does not have a tie or pin, glue a ribbon to the back of the object and secure it to the center drape. Autumn will give you plenty of opportunities to embrace dark autumn colours. Choose a dark coloured chair with intricate detailing. Tie a string of realistic, sturdy, crimson apples together. Dramatically drape a contrasting coloured drape between the back points of the chair. Artfully place the string of apples over the draping so that the draping appears to hold the apples like a basket. Chose a dark coloured chair cover to completely cover each chair. Take a lantern with a loop at the top and run a ribbon through it. Tie the ribbon around the chair so that the lantern hangs in the center of the back of the chair. Winter themes are a beautiful excuse to incorporate glitter, snowflakes, and warm blankets. Take the opportunity to make winter themes feel magical. Select a light blue, white, or cream coloured sheer drape and lay it out. Spray the drape with hairspray and sprinkle glitter overtop of it. Glitter may be silver, white, clear, or blue. Tie one end of the drape to the top of one side of the chair. Pull the other end of the drape open and secure half to the top of the other side of the chair. Let the rest of the drape hang naturally. Carefully select a chair with at least one horizontal rung. Choose a few flannel blankets. These blankets do not have to match. Hang these blankets over the rung so that both ends come through to the back. For an added touch, gather the ends and tie them with a simple ribbon that matches your theme. There are thousands of possible themes for weddings, but the following themes are very popular. String long lines of pearls. You may string a line of many pearls or a line with few pearls glued into place. Select a few neutral coloured ribbons. 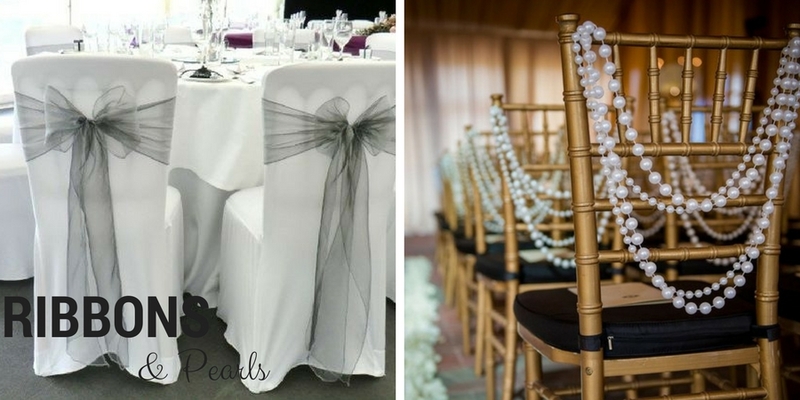 Alternate draping ribbons and pearls so that the chair looks like it is wearing a romantic necklace. Spacing between pieces is up to you. Select a small heart shaped wreath (this may be made out of straw, grass, sticks, or other natural materials). Gather a small bouquet of peach, pink, and cream colored roses and secure it to one side of the heart-shaped wreath. Secure the heart-shaped wreath to the back of the chair using cream, white, or neutral colored ribbons. Modern weddings thrive on metallic colours, clean lines, and glamour. Consider the following DIY ideas. If you own the chairs you will be using, glue gemstones directly to the chair in neat rows. If you do not own the chairs you will be using, select a very thick dark grey ribbon and glue rows of gemstones to the ribbon. Tie a tight ribbon around the chair with your bedazzled ribbon. If gems fall off of the ribbon when tying, simply glue them back on. Gather small, clear, straight vases. Place a single flower in each glass and tie a navy blue ribbon around the neck of the vase. Tie the small flower and vase to one side of the chair for a clean look. For an added touch, add gemstones to the knot in the ribbon at the neck of the vase. There is something to be said about the simple, light-hearted, and airy feel of a country themed wedding. This wedding theme tends to bloom into some of the most creative and innovative DIY opportunities. Select a long strip of burlap. 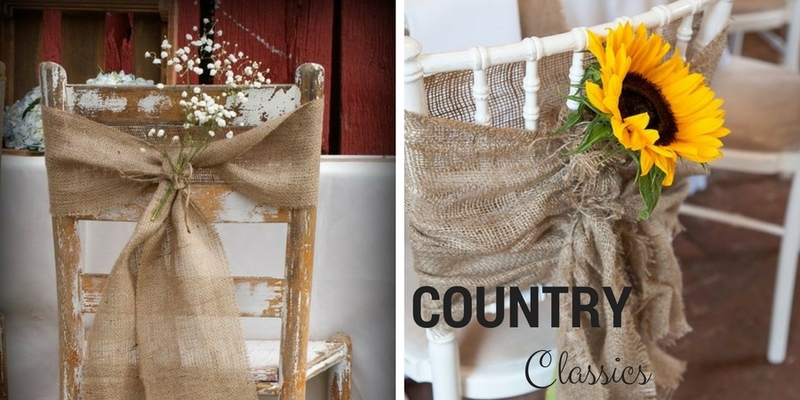 Intertwine the strip of burlap throughout the rungs of the chair. The exact design can vary from chair to chair. Weave small stems of baby’s breath throughout. Each stem will slide between the weaving in the burlap for a natural look. Select a leafy strand of garland. Secure one end to the top of one side of the chair, run the garland across the top, secure it, and then across the bottom to the other side of the chair where the back meets the seat. Then let the remainder of the strand fall to the ground. Tie a large ribbon of lace to the middle of the bottom of the back of the chair just above the seat. For an added personal touch, add a rose or two to one side of the chair in the top corner. The themes listed above are among just a few of the common themes you may choose from. 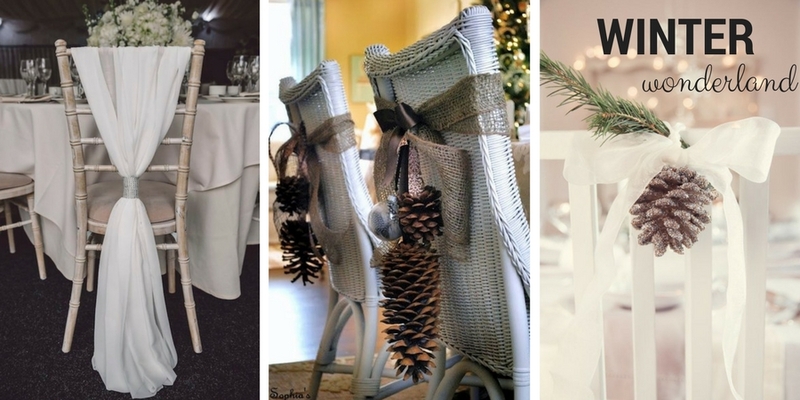 These decoration ideas for your reception chairs can be altered to fit your perfect vision. Only one thing is certain- your guests are going to be eating in style at your reception. If you are unsure of the type of chairs to hire, view our chair hire guide or contact the hire team direct.